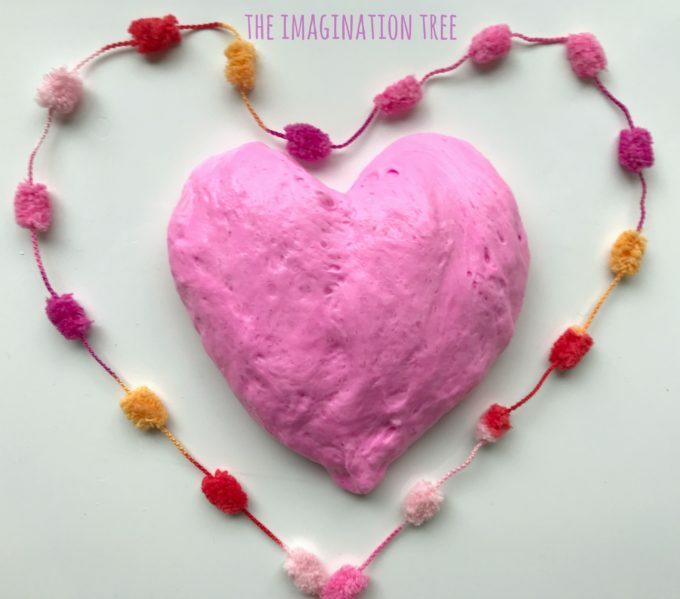 Make some gorgeous, soft and stretchy Valentine’s Fluffy Slime to give as gifts to friends on Valentine’s Day! 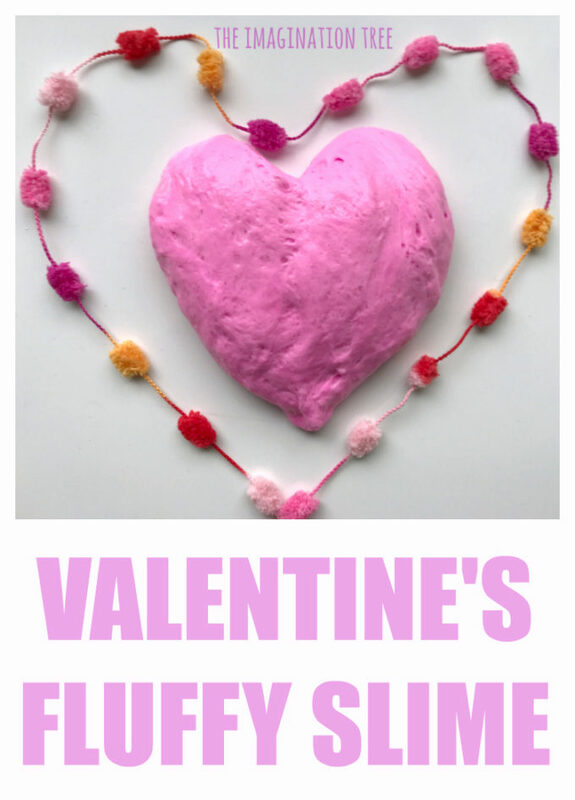 Our Valentine’s Fluffy Slime recipe takes less than two minutes to make and is SO much fun to play with for all ages over 3! 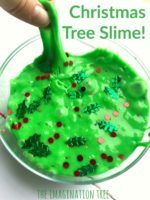 This is a fun twist on the easy peasy slime recipe using UK ingredients that I have written about before. We are still having lots of fun making plenty of crazy slime concoctions at this house, with 4 kids who can’t stop playing with it and thinking up fabulous new ingredients to add in each time we mix a new batch! I was even interviewed on BBC Radio 5 Live recently talking about our favourite slimes!  I can certainly see how it becomes an addictive hobby for kids! With one added extra ingredient to the usual recipe it becomes SUPER thick and fluffy and doubles to volume and fun! 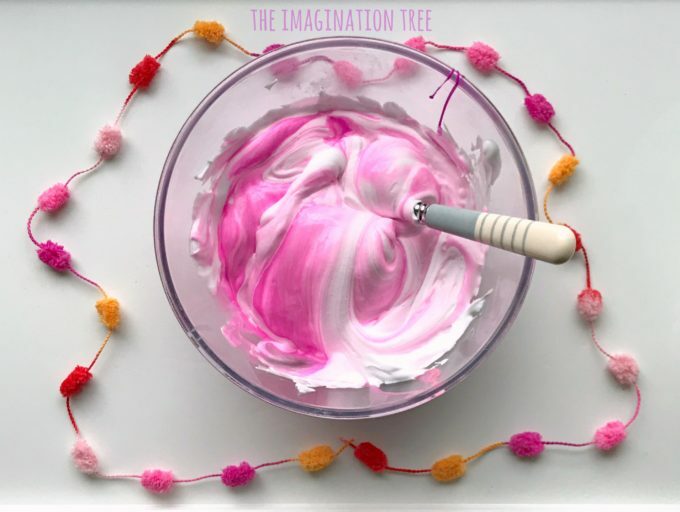 This Valentine’s Fluffy Slime would be just perfect to divide into little pots and give to friends at school for Valentine’s day or as party favours at the end of a kiddie/ tween party. Tip 1 cup of the PVA glue into a clean bowl. Add a couple of squirts of your chosen paint colour then mix it well. We used pink and purple for a Valentine’s theme! Next fold in 2 cups of the shaving cream, not mixing too much so that it retains its air and volume. Next add 1-2 tablespoons of contact lens solution. Start with 1 then add the second slowly. At this stage take it out of the bowl and knead it between your hands. It will start off sticking to them but within about 20 seconds it will firm up and stick only to itself, becoming elastic and super stretchy. Sprinkle a large amount of sparkly pink glitter over the top and get ready to PLAY! If for some reason it’s still too sticky then add just a few more drops of contact lens solution until it’s just right. Be careful as too much will result in it becoming brittle and snapping. It will be wonderfully FLUFFY, squishy and voluminous to touch and is so wonderfully tactile. Now streeeeeetch it, squeeze it, roll it, skip with it, snip it with scissors, poke fingers into it, make air bubbles and pop them and PLAY until the cows come home! Slime is an amazing tool for fine motor skills development so that’s great to know what’s happening in the background while they play. Why not package it into small containers like these , add a handwritten label and give them out for Valentine’s favours?! OR turn it into a fun party activity which then becomes the take home gift at the end too- perfect! If the kids get the slime on their clothes … DON’T PANIC! I’ve now found an easy way to get clean it off by simply squirting on washing up liquid/ dish soap, leaving it to soak in a bowl of water and then washing as usual in the machine. Comes right off, phew! If you loved this Valentine’s Fluffy Slime then you will really enjoy browsing the SLIME ARCHIVES here! Plenty for you to get started with, from easy peasy basic slime to scented lavender slime, galaxy slime, confetti party slime and loads more! « Confetti Party Slime Recipe! I shy away from slime as have read so much on how the Boric Acid for young delicate skin (my son is 3) is just not good at all and can cause skin reactions etc. What is your advice/opinion on this as I love your blog, follow regularly and know my son would love some slime but I just don’t go there for this reason/s. How would you recommend storing the slime? I made this a few days ago and it’s decreased involume and become stickier, I think the shaving foam has gone. Or does it only last as well that day? This is so cool! My kids are going to LOVE this! And we have all of the supplies on hand already! Thanks.